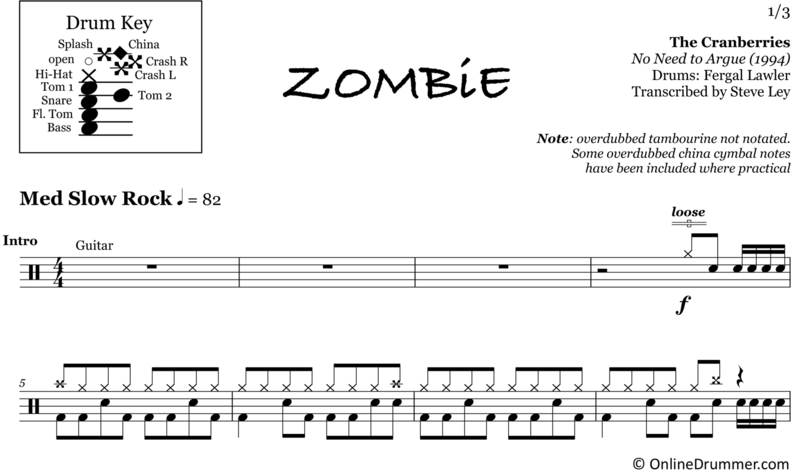 The full drum sheet music for “Zombie” by The Cranberries from the album No Need to Argue (1994). “Zombie” is one of those classic gems that typifies the ’90s alternative rock scene. The Cranberries found success throughout the world, reaching #1 on the chart in countries worldwide. Fergal Lawler played a dynamic, solid drum part. Throughout the verses of the song, Lawler uses a unique arrangement of sixteenth notes on the hi-hat while playing the 2/4 backbeat on the tom. The choruses are ripe with loose, smashing hi-hats pieced together with well-placed crash accents. NOTE: A very popular part of the drum track is the china cymbal. However, the china cymbal is an overdub, which was added in the studio and not originally placed when Lawler recorded his drum part. Because we believe the china cymbals are important to reproducing the full sound on the album, we’ve notated the most essential (and playable) china strokes in our sheet music.